Hitting theaters on Wednesday, April 17, Breakthrough, from executive producer DeVon Franklin (The Star, Miracles From Heaven), is based on the true story of St. Louis teen John Smith, who broke through lake ice and was apparently dead for almost an hour, until, after his mother Joyce’s fervent prayer, he came back to life. 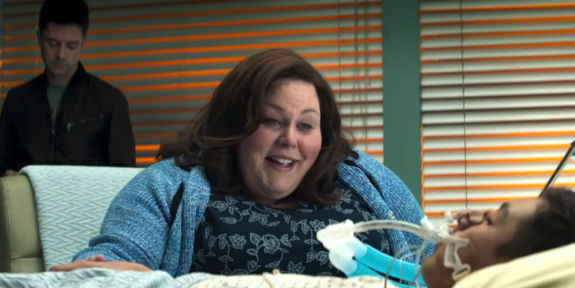 Directed by Roxann Dawson (the former actor’s first film, after directing lots of TV), and adapted by Grant Nieporte from Joyce Smith’s book, The Impossible, Breakthrough stars Marcel Ruiz as basketball-loving John; This Is Us star Chrissy Metz as Joyce; Josh Lucas as her husband, Brian; Topher Grace as their pastor, Jason; and Dennis Haysbert as John’s physician, Dr. Garrett. Thanks to Dawson, Breakthrough is more stylish than many faith-based films (it is a 20th Century Fox production), and its story does have the advantage of being true. It’s also backed up by a lot of medical evidence as to the unlikeliness of John’s survival and recovery. The script lightly touches, but does not do a deep dive into, thorny issues like, why one person is miraculously saved and not another, or why not all prayers are answered. Also lifting Breakthrough are the portrayals of the parents as less-than-perfect people. Metz’s plays Joyce as a fiercely devoted mother who can’t figure out how to make her Guatemalan-born adopted son feel wanted, but whose singleminded, almost manic determination that he would live rivals the emotional intensity of Metz’s high-drama This Is Us character. At the same time, Lucas’ Brian hangs back at the hospital, unable to match his wife’s intensity and refusing to face the situation head-on. In the end, Breakthrough is affecting but not necessarily profound. We’re meant to celebrate the miracle without thinking about it too much. But it does leave room for people to draw their own conclusions, and that may make it interesting for secular audiences. The number one takeaway is that prayer works, love wins. Really when you think about it, it’s like why would Joyce pray that hard? ‘Cause of her love? I think that’s just so powerful. There’s so many films that celebrate superheroes that are great. Hey, those are billion dollar movies. But they’re all imagination; this is real. And what Joyce did is a real superhero doing a real superpower, which is faith and praying. So I really want people to take that away. I want people to take away that they’re valued. We can go through life feeling that we’re alone, and that we don’t matter. This movie I think shows that we do matter. All of the people in the community that first responders, the pastor, the congregation, the basketball team, the teachers, the school, they all interceded for one. To me, if we do that, the whole culture changes for the better. We don’t do it enough. I think, I’m hoping, people will take that away when they leave the theater. That we’re stronger together than we are apart, and there’s all of these people on the planet to learn from, to teach, to learn, to grow, to evolve with each other, Otherwise there’d be one person on the planet. There’s a reason why we all look differently and like different things, come from different backgrounds, because we’re all here to teach each other, whether it’s empathy or tolerance or self-love in order to impart that on other people. So, I hope that that’s what people take away. It’s just amazing to see how many responses we’ve gotten from atheists, from unbelievers. This has sparked curiosity regarding, “What is God?” And also the science part of it — that there is no answer for me. I say that respectfully. when there is 300-plus pages of medical documents of why I should be dead, but I’m alive. So unbelievers see that and go “Oh, it can’t just be another God-based film.” Now we have doctors that are on our side to pull more unbelievers and to get them to believe that this is a bona-fide miracle. And the only person that can do this is God. And I truly believe that’s what separates us. You mess with her, you’re in trouble. And her faith for God is just stronger than … I want to be like my mom, when it comes on to that sort of thing. Whether she is sick, ill, she never complains. It’s always “OK, God, I believe in you. This is just an attack. Let’s move forward. Let’s keep pushing back on the enemy.” That’s my mom in a nutshell.